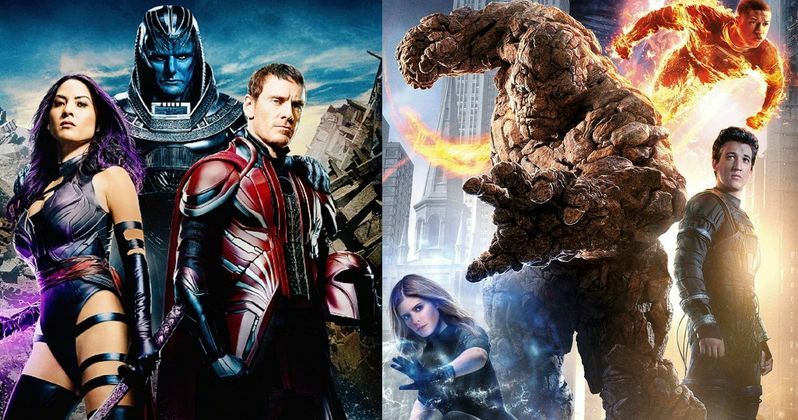 Before Comic-Con got off to it's rousing start, with both casts of X-Men: Apocalypse and Fantastic Four arriving in person to show off new footage, it was heavily reported that 20th Century Fox was finally ready to merge both properties for an epic X-Men/Fantastic Four Crossover Movie. Resting at the heart of this rumor was the fact that director Bryan Singer was behind it all. He recently talked to Yahoo Movies about the rumors and reveals that, yes, those talks are indeed happening. He explained the following. "Those ideas are in play. That would be a natural match-up because they're both ensemble films and there is a natural mechanism by which to do it. It deals with time. That's all I'm going to say." Cryptic remarks, indeed. When he mentions the word 'time', it could be taken in a number of many different directions. As he hints, these movie franchise both have ensemble casts that are some of the biggest in the superhero genre. It will be incredibly difficult to get everyone together, with all of their busy schedules sorted out, as some of the most sought after actors in Hollywood currently make up these two teams. Then, of course, when he utters the word 'time', he may be talking about the plot of the crossover itself. X-Men: Days of Future Past was, at its core, a time travel movie. And the events that played out greatly altered the X-Men movie series timeline. X-Men: Apocalypse will also have time travel elements, and the new Fantastic Four reboot deals with alternate plains of existence. So, his remarks could be viewed with a two-edged connotation. The director isn't eager to say outright that a X-Men/Fantastic Four Crossover Movie is happening. Because who knows how fans will greet the Fantastic Four remake hitting theaters next month. While X-Men: Apocalypse will surely be a hit inline with the other movies in the series, no one knows how Fantastic Four will fare at the box office. It could be a major flop. And even the already announced The Fantastic Four 2, which has a June 2017 release date in place, could be canceled. Bryan Singer had this to say about jumping the gun on the X-Men/Fantastic Four Crossover Movie crossover. "We'll have to see how the films turn out. To just say you're going to do it would be a mistake, you have to see how the films evolve before you make that decision to completely commit to that." With the altered timeline set up by X-Men: Days of Future Past, Bryan Singer has been able to right some of the wrongs of the previous movies. He's even bringing back some fan favorite characters, recast with younger actors who will surely carry the franchise into the future. The earlier rumor suggests that Bryan Singer will direct The Fantastic Four 2, taking over for Josh Trank. He will establish the ideas that Mutants exist in that world, with a story that will directly lead into the X-Men/Fantastic Four Crossover Movie, which he'll also direct. Its been said that 20th Century fox doesn't want to lose the combination of director Bryan Singer and producer Simon Kinberg, who understand both franchises, and are the only ones who can properly build their own version of Marvel's Cinematic universe, incorporating both franchises. Right now, Bryan Singer isn't attached to direct any other movies after X-Men: Apocalypse. And we're not even sure where the franchise is heading after that, except for the 2016 spinoffs Deadpool and Gambit. Then again, it's possible that the studio may want the director to make both The Fantastic Four 2, set for release on June 9, 2017, and the crossover for 2018, which could be a tall order to fill, and may even require the director to shoot them both back-to-back. What do you think of this impending superhero crossover?